Kick off your visit on the 11th (Tue): appreciate the extensive heritage of Bicentennial Capitol Mall State Park, then stop by The Rocket Fizz Soda Pop and Candy Shop, and then take a stroll through Downtown Nashville. To see other places to visit, maps, reviews, and tourist information, go to the Nashville trip itinerary builder site . Gloucester to Nashville is an approximately 6-hour flight. You can also drive. You'll gain 1 hour traveling from Gloucester to Nashville due to the time zone difference. June in Nashville sees daily highs of 88°F and lows of 67°F at night. 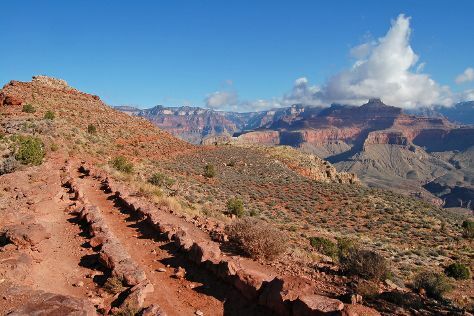 Cap off your sightseeing on the 11th (Tue) early enough to travel to Grand Canyon National Park. Moonshine Beach has been added to your itinerary. On the 12th (Wed), explore the fascinating underground world of Cosmic Cavern, explore the fascinating underground world of Talking Rocks Cavern, then kick back and relax at Moonshine Beach, and finally take an in-depth tour of Veterans Memorial Museum. Get ready for a full day of sightseeing on the next day: tour the pleasant surroundings at Lost Canyon Nature Trail and Cave, take in the waterfront activity at State Park Marina, and then admire the majestic nature at Table Rock State Park. Find out how to plan Branson trip without stress by asking Inspirock to help create an itinerary. You can fly from Nashville to Branson in 7 hours. Other options are to do a combination of flight and car; or drive. In June, daily temperatures in Branson can reach 84°F, while at night they dip to 65°F. Finish up your sightseeing early on the 14th (Fri) so you can travel to Grand Canyon National Park. Many residents have shunned fast-paced city living for Taos's laid-back vibe and blend of Spanish, Native American, and Anglo cultures. Wild Earth Llama Adventures has been added to your itinerary. Kick off your visit on the 14th (Fri): take in the exciting artwork at Enchanted Circle Pottery and then steep yourself in history at Blumenschein Home & Museum. On the next day, explore the ancient world of Taos Pueblo, identify plant and animal life at Wheeler Peak Wilderness, and then make a short side trip with Wild Earth Llama Adventures. To see maps, reviews, ratings, and more tourist information, you can read our Taos planner . You can do a combination of flight and car from Branson to Taos in 7.5 hours. Alternatively, you can do a combination of flight and shuttle; or drive. The time zone difference moving from Central Standard Time to Mountain Standard Time is minus 1 hour. Traveling from Branson in June, expect slightly colder with lows of 46°F in Taos. Finish up your sightseeing early on the 17th (Mon) so you can go by car to Grand Canyon National Park. Start off your visit on the 17th (Mon): stop by Lookout Studio. To see photos, ratings, traveler tips, and other tourist information, refer to the Grand Canyon National Park road trip tool . You can drive from Taos to Grand Canyon National Park in 8.5 hours. In June, daily temperatures in Grand Canyon National Park can reach 85°F, while at night they dip to 42°F. Finish your sightseeing early on the 18th (Tue) so you can drive back home.